Students and researchers all write under pressure, and those pressures—most lamentably, the desire to impress your audience rather than to communicate with them—often lead to pretentious prose, academic posturing, and, not infrequently, writer’s block. Sociologist Howard S. Becker has written the classic book on how to conquer these pressures and simply write. 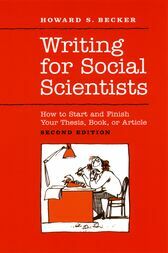 First published nearly twenty years ago, Writing for Social Scientists has become a lifesaver for writers in all fields, from beginning students to published authors. Becker’s message is clear: in order to learn how to write, take a deep breath and then begin writing. Revise. Repeat. In this new edition, Becker takes account of major changes in the computer tools available to writers today, and also substantially expands his analysis of how academic institutions create problems for them. As competition in academia grows increasingly heated, Writing for Social Scientists will provide solace to a new generation of frazzled, would-be writers. Howard S. Becker lives and works in San Francisco. He is the author of several books, including Outsiders, Tricks of the Trade, and Telling About Society.